The value of something is often based in large part on its real or perceived availability. In the world of watches, especially with regards to collecting, rarity is a large factor contributing to the cost of a luxury timepiece. The reason is because rarity is almost always an implied condition that seems beyond control – like it just happens. The reality is usually never that simple, especially with new timepieces. But the effect leads to valuing rarer watches, materials, and even techniques more than others of relatively equal standing. That statement is bound to draw disagreement, and such disagreement is perfectly justifiable. Rarity and the assumed value based on rarity are all tied to emotion. Emotion is a perfectly valid reason to value something, otherwise humans would never fall in love, fight for their country, or sacrifice anything for the good of others. But through the years I have come to discover that I am often a pragmatist and therefore making decisions based solely on emotion usually doesn’t work out. So in the world of watches and collecting I end up standing on the opposite side of the fence from the majority. That is why today I am offering up another edition of “Here’s Why” in which I focus on what I consider to be the most precious metal in watchmaking: stainless steel. That’s right, I think that out of all the metals, especially the white metals like platinum and white gold, stainless steel is the most precious metal. Why do I think stainless steel is the most precious metal? There are many reasons to be sure, but I want to start with a general statement that will drive the discussion forward. It also may be the most obvious and most debatable: stainless steel looks very similar to white gold and platinum, so much so that there isn’t much reason to use either of the latter. When describing colors of metals, especially in polished form, we usually use words like brightness, hue, cast, and tint to portray the visual differences. Hue specifically relates to the actual color while tint is an additional color to the main color. A color cast is usually related to film that is generally the result of light, reflections, and the mixtures of hue and tints, which provide an overall sense of another color. This is why white appears in variety of other colors under different lighting conditions and with different colors nearby. While stainless steel, white gold, and platinum are all very similar, I will admit there are very subtle differences. When it comes to white gold, which is a gold alloy that French speakers call or gris (grey gold), there will always be a warmer, slightly yellowish tint to it. Depending on which other metal is used in the alloy – be it platinum, silver, or nickel – the whiteness can be slightly different. Platinum alloys can vary as well but tend to be a brighter white than white gold with no color cast. If iridium or ruthenium is used as the alloying metal, platinum will retain an almost pure white hue. However, if cobalt is used (another very common alloying metal), then there is a bluish hue that nudges the platinum closer to the color of stainless steel. That alloy is usually plated with rhodium, which also returns it to a bright white luster and provides better abrasion resistance. 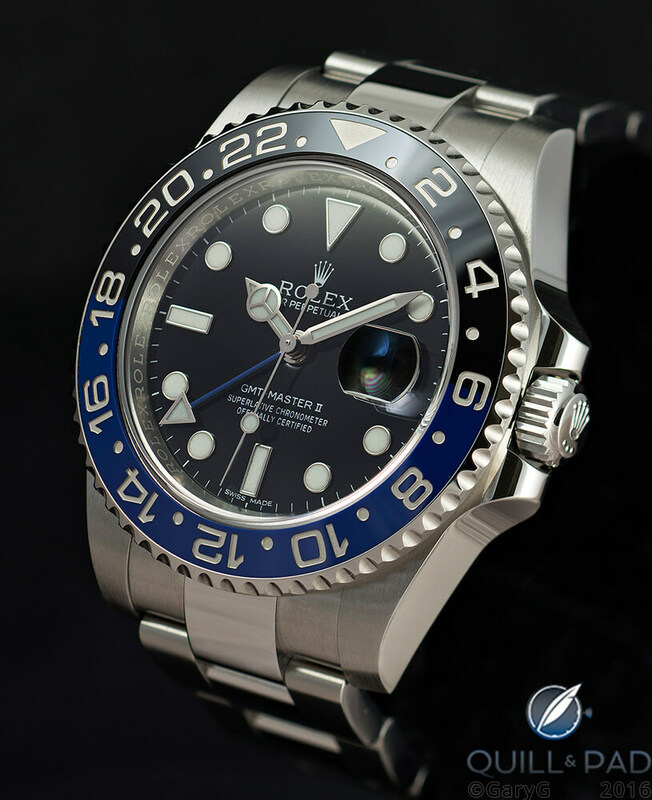 Almost all stainless steel used in modern watches is of a variety called 316L – or in the case of Rolex, 904L. Both steels can be polished to a very high luster and have a slight bluish cast. The brightness is on par with white gold and only slightly less bright than platinum. Nonetheless, stainless steel will seem a bit cooler than precious metals. These differences, however, are very subtle; most people cannot tell the metals apart unless that are placed side by side under a bright light. Experienced collectors and jewelers may be more able to spot the differences simply due to repeated exposure to the different metals, but they are the exception and not the rule. If we are being honest, the visual difference between the three metals is mostly negligible. A preference for the slight variation of platinum or white gold over stainless steel is akin to choosing wall paint in ivory white over baby powder white (actual different colors). Sure, you can tell them apart when they are placed right next to each other, but seeing color has more to do with adjacent colors, contrast, and varying light sources than the actual hue. For the sake of argument, though, let’s assume that for whatever reason, you just like the look of platinum or white gold a little bit more than stainless steel. This is perfectly fine; it’s a feeling that can’t be negated. But let’s look at it another way: by choosing one over the other, we’re paying a premium for having a slightly different appearance and more weight. To set a baseline, the visual difference between yellow gold and stainless steel is glaringly obvious, and for this example it will represent a 100 percent difference in visual appearance (not taking into consideration metal coatings like PVD or DLC). If yellow gold versus stainless steel tops out the scale, what then would be the percentage difference between stainless steel and platinum? Maybe a 2 percent difference? Continuing on this theme, the difference between white gold and stainless steel might be a bit less, maybe 1.5 percent difference. When it is put into terms like that, it becomes obvious that you are paying a premium for a very small difference in appearance. How much of a premium? Stainless steel currently is trading at $1.94 per kilogram, which equals about $0.05 per ounce. Platinum is currently at $1,087.20 per ounce, while white gold (depending on whether it is 18, 20, or 21-karat) hovers between $991.50 and $1,156.75 per ounce. This means that the premium for precious metals could theoretically be 20,000 times that of the stainless steel. Of course, this isn’t how the watch industry works, but it should show that the cost of the stainless steel is negligible when determining the cost of a timepiece, while the cost of the white gold and platinum is definitely a tangible consideration. Basically, the base price of a steel timepiece increases when you switch to a precious metal, however it is not linearly based on the cost of the actual metal used. The price increase for a watch housed in a precious metal case is usually completely arbitrary based on the manufacturer and other aspects that could even be features of the timepiece such as complications. For this example, taking the Rolex Daytona in stainless steel, white gold, and platinum provides the best illustration of how much the premium increases for each metal. The amount of precious metal in a watch case varies greatly by style, whether a bracelet is involved, and what specific alloy is used. But a safe general estimate would be 1.5 to 3 ounces (40 to 90 grams) of precious metal in any given case, which still allows for a wide margin of error. Even given that margin of error, the cost of all the precious metals ends up being somewhere between $1,000 and $3,000, nowhere near the premium charged for these materials (the premium partially comes from another aspect I’ll get to). For a Daytona, white gold commands a $10,000 premium, while platinum sees a more than $35,000 increase in cost. Stainless steel is the only metal that doesn’t see a premium attached (well, unless it’s a Patek Philippe or one of those ultra-rare A. Lange & Söhne Lange 1 models, see The Value Of Rarity: Christie’s Auctions A Black-Dialed A. Lange & Söhne Lange 1 In Stainless Steel), so you are much closer to getting what you pay for in sheer value. If a watch in precious metal is purchased as an investment, the value of the timepiece is tied much more to other factors than the precious metals included, since you see that the cost of the metals isn’t much of a real factor in retail price. Stainless steel clearly is a much smarter buy if you want to get the most bang for your buck and avoid paying hefty premiums. About those premiums . . . why aren’t they tied more closely to the cost of the material? One answer is simple: implied scarcity and limited production. But those reasons, for new watches at least, are partially controlled by internal decisions (brands imposing limits on their own models rather than market forces or material availability) and partially cultivated emotions on the part of the buyer. When a brand wants to charge more for a stainless steel watch, the only thing it can really do is make the watch more complicated (becoming a different watch at that point), add gemstones, or limit the production. The limited availability increases demand per timepiece, therefore justifying increasing the price. The perception of the metals being rare does much more to imply limited availability than a brand can do by limiting production. The entire jewelry industry does its very best to make it seem like precious metals are exceedingly rare. And, while in all honesty, they are definitely rare compared to steel, the reality isn’t as cut and dry. The average yearly production of steel is 9.5 million times more than platinum, though this number is nearly useless without corresponding numbers for both (though for gold, and at least partially platinum, our Ian Skellern has managed to unearth some usable numbers, which you can find in How To Make Gold. Warning: Don’t Try This At Home!). Let’s continue with the platinum example. On average, 1.5 billion tons of steel is produced each year, a very large number. Given that huge number, it might become a bit more surprising to learn that on average 150 tons (330,700 pounds) of platinum are produced yearly. While this is much, much less than steel, it is no small amount of material. This is around seven cubic meters of platinum, or enough to make approximately 1.65 million solid platinum watch cases using a high estimate of around 90 grams per case. Of course, the amount of that yearly production of platinum that is earmarked for much more important industrial uses is significant; the entire jewelry industry uses a little less than 25 percent of the total, which does reduce the availability of platinum. Still, that could leave room for hundreds of thousands of solid platinum cases. Gold is a similar story, with a majority of the average 2,500 tons a year going to other uses such as electronics and aerospace, but an even higher 45 percent of the yearly production still goes to jewelry. Rarity is really all relative, and in this case, not rare enough in the sense that should justify paying such a premium for it. Stainless steel comes with no implied rarity and no inflated cost, making the price of a watch in stainless steel much more accurate related to the watch itself. But none of what I have already discussed proves the case for stainless steel over precious metals aside from a purely economic or emotional standpoint. That is all debatable and decisions can be made for reasons that might not make perfect logical sense. What really matters is how the materials perform, and this is where stainless steel leaves the precious metals in the dust. In purely engineering terms, stainless steel is a much better material for a watch case. Gold and platinum are ancient metals that people have used for thousands of years. And so they were established as fine jewelry materials because they hold a shine without tarnishing and were easy to work with. The second part of that sentence might sound good, but it is also what condemns precious metals: their general workability. Gold and platinum are soft and allow for easy working using traditional tools and methods. For this reason to be used in jewelry, and especially, watch cases, the gold and platinum needs to be mixed with other metals to increase hardness, stiffness, durability, and wear resistance. As the percentage of other metals in the precious metal alloy increases, the properties approach the realm of strength and durability that stainless steel basks in all day long. Some may argue that stainless steel is an alloy too, and I won’t dispute that fact. But the argument that precious metals are inherently better because they are rarer falls away when you have to add base metals just to make them usable. The typical platinum alloys used in watch cases are 95 percent platinum and 5 percent ruthenium or 95 percent platinum and 5 percent iridium by mass (that also changes the purity of 950 platinum based on the alloy metal used and its specific density). These two alloys have specific properties to them that makes them better or worse as materials for a watch case. The platinum/iridium alloy is soft and dings easily. Unless it is hardened, it has half the strength (based on Vickers hardness) of soft white gold or annealed stainless steel. Platinum/ruthenium alloys fare better, being in the same ballpark as annealed white gold or 316L stainless steel. Materials science nerd side note: an annealed state is the softest state a metal can be in after heating and cooling; most metals must usually be worked and hardened in some manner before use. Using a metal in an annealed state is useful for shaping and forming before final hardening. White gold, platinum, and stainless steel cases are heat-treated and hardened before being utilized. As a frame of reference, titanium can be in the mid 800s Vickers, and ceramics can be two to four times that number. The maximum hardness for the best case scenario platinum or white gold alloys is right around 230 Vickers. Stainless steel, in its soft, fully annealed state is about 155 Vickers, but at full hardening can reach 390 Vickers, which is 70 percent harder than platinum or white gold. This means that stainless steel will resist wear, dents, dings, and scratches better than either white gold or platinum. Plus, when platinum or white gold are hardened, they become more brittle than stainless steel, which could cause issues with cracking that the steel won’t experience under a similar force (like banging it against a door frame really hard). Stainless steel is much better at absorbing shocks and standing up to abuses suffered while on the wrist, all while continuing to look amazing. The properties of precious metals also end up affecting the fabrication methods that modern companies use. Most cases are machined to their final form, even if some are first stamped and forged. The machining process is much more difficult with gold and platinum due to the density of the material. Where you might be able to machine 50 stainless steel cases before the cutting tool needs to be replaced, you may only cut 5 or 10 cases in a precious metal. The extremely dense platinum and gold simply wear the tools away much faster, increasing production cycle time and cost to produce each piece. This added difficulty is actually where some of the premium for precious metals comes from. Also consider that when working with precious metals of such high value, the production process must be much more controlled regarding personnel, security, and material waste collection. Steel is “cheap,” but gold and platinum is so valuable that every tiny little chip created during machining must be carefully collected to be melted back down and used again. This adds a large amount of effort to production that just isn’t needed with stainless steel. After this exhausting discussion, one thing should have become clear: stainless steel is an affordable, more efficient, and stronger material for use in watch cases than precious metal alternatives. If pure performance is desired, stainless steel wins every time. If looks are desired, the argument is difficult to make for platinum or white gold over stainless steel. If value is preferred, I don’t think anyone can make an argument for the added expense of precious metals. If rarity and exclusivity are yearned for, well, stainless steel is just not a choice then. Stainless steel is well known and affordable, but it will never have the allure of noble metals. That is just reality. Stainless steel wasn’t even invented until the turn of the last century, but gold and platinum were used by every great society throughout history going back to the Egyptians. Our personal preferences for white gold or platinum over stainless steel are usually dictated by how the metal makes us feel. As someone who likes to actually wear watches every day — and I really mean exposing the watch to wear (gasp!) in my job – stainless steel is the most precious of metals for me. It can look incredible when polished or brushed and can hold up to the rigors of daily wear. Titanium and ceramic are pretty awesome too, but humans still like those bright, shiny objects, and I feel that pull too. So I guess stainless steel is the best of both worlds for me: it has the looks and the brawn to perform like I want it to. Stainless steel really is a marvel of engineering, and I thank science for providing a beautiful and strong alternative to precious metals. What are your thoughts? Sound off in the comments about what metal is your favorite or if you agree or disagree that stainless steel is much more precious a material! Presumably another ( and rather large) part of the extra cost of precious metal versions of watches is due to the cost of carrying the investment in the metal through to sales – just as the cost of all the labour involved in making the watch will be marked up (perhaps by a factor of 10 if you believe the oft-stated idea that a $5,000 watch costs $500 to make!). Cost and price are not related. I think that cost and price are very much related, it’s cost/price and value that have a more tenuous connection. Thank you Joshua for this absolutely interesting and definitely not exhausting article. Learned a lot. I always had the feeling that it’s just not worth it going for the premium even if I had the money. I very often wear a Sinn U1 as my daily watch. Its steal bezel has 1500 Vickers which gives me a good d feeling and is definitely a big advantage if you’re not only sitting at a desk the whole day. Just in case other readers aren’t aware, Sinn hardens the steel used for some of its extreme sports watches in a process it calls “tegimenting.” This makes the Sinn steel extra hard, even up to 1500 Vickers. Sinn are not given enough attention. Using diamond pallets and a hardened steel escape wheel they made a Swiss lever escapment that didn’t need lubrication several years ago. Yes, but I believe that that particular escapement model became a one-off creation that was only used in one model. My only problem with Sinn, and I own two including a U1, is that their accuracy is terrible compared to Rolex. My Rolexes are around 1.5 to two seconds a day off. Sinn is 15 seconds a day. That’s very interesting, Sean! Thank you for sharing. Wearing a watch made of gold or platinum has a certain weight to it that steel just doesn’t have (due to the density you breifly touched on). That alone can justify a price differential. Thank you for putting forth in a very cogent manner what I’ve been harping on about for ages. Yes, the premium one has to pay for a precious metal watch is in no way justifiable but, more to the point, precious metal watches are so much more vulnerable to normal daily wear and tear! I have a PP World Timer which, of course, I never wear when traveling for fear of dinging it when boarding a plane and throwing luggage around. Indeed, for some time I’ve been looking for the ideal dress GMT in steel. It’s gotten to the point where I’d pay the same money as its precious metal sibling just for the added durability. Laurent Ferrier, F.P. Journe, H. Moser… what I wouldn’t give to be able to buy one of their watches (GMT or dual time) in steel. Just the other day I was looking yet again at the gorgeous Slim d’Hermès perpetual calendar. Did you know it has a second time zone, too? Ahhhhhhhhh! Please, make it in steel! Or the newly revamped VC Harmony dual time. Guys, you’re breaking my heart. I was recently at an event in NYC for F.P. Journe. It was early and there were not yet that many people there and I suddenly found myself standing next to M. Journe himself. I think he felt a bit awkward because he doesn’t speak much English but being half Swiss I was able to jump in and talk to him. After congratulating him profusely for creating the most stunning works of horological art I broached this very subject. Sadly, it seems that the perception is that a dress time piece will never be taken seriously unless it is made of precious (or other exotic) metal. Ugh. Anyway, great article. Platinum never looses its weight and density when it’s subject to scratches, dings, bangs whereas if other materials including gold can loose in their weight when polished to cure the scratches. Platinum never looses its weight. That’s why when I buy precious metal watches or jewelry, I only buy yellow or rose gold. I avoid white color precious metal like a plague. I tend to laugh at my buds whom prefer to buy white gold or platinum jewelry due to wanting to be non-conspicuous but yet want a precious metal something. No one in their right mind would buy something that looks like steel but costs more than triple of it. It’s like buying a Ferrari that looks like a Honda but priced like a Ferrari. Only in America where white gold and platinum is more popular than yellow and rose gold. No where else in the world would people buy white gold watches. Your Yellow or Rose gold is mixed with the same amounts of other metal in the matrix as the white gold models. What i find mysterious is that silver is not used in its pure form as a case material. Although is it used in some quantities to make yellow and pink gold, watches made of a silver cases are generally not observed. There may be some reasons I don’t know, but if you look at the value, silver is 33.5$ per ounce which makes it more precious than steel but less than gold or platinum. In addition, it has a Vickers hardness of 250, less than titanium but more or less the same as gold or platinum. Moreover, it can be oxidized to give it a hue from silver to black. So can silver be used as a case material? And why is it normally not used as a case material? Silver is not a good material for watch cases because it oxidizes, which is not a desired effect here. However, Hermès has a silver alloy that it used in 2014 Cape Cod models that does not oxidize. We will actually be publishing something more about this before the end of the year. Love this article. Great food for thought. I can’t deny that emotion plays a huge part in my decisions, making me a marketing department’s dream consumer. I had a long-standing desire to find the ultimate material for a set of jewelry that I can “always” wear, for the rest of my life, without intense upkeep or the need to constantly protect it from daily activities. I spent probably over one-hundred hours researching the properties of various metals. What I found was basically summed up in this article (if only I had found this before all that research!). I got the impression that apart from the obvious benefits of SS over gold or platinum (resistance to scratches) the material is less reactive than gold. I had previously thought that gold was just as resistant to reactions, but I learned that simple every-day exposure to chlorine and other common substances can cause gold to pit or stain. I also learned that although platinum is more resistant to chlorine and salt-water corrosion than 316L steel, the difference is only visible in the range of 300º-400º Celsius and above, which is three to four times the boiling temperature of water. Thus, the difference is really not pertinent, since I really don’t plan on hanging out in heat that will melt the skin off my body. And if I ever was subjected to that kind of heat, I probably wouldn’t care about my jewelry at that point. Besides the corrosion resistance, platinum apparently is known to develop a light patina that slightly darkens the appearance of the metal. With time, platinum looks nearly as dark as titanium, which surprised me. SS does not patina, corrode, or break under normal circumstances. As a result of my these findings, I dropped quite a bit of money into that set of jewelry. I got a nice Citizen Eco-Drive watch (my family owns Vacheron-Constantin, Rolex, and Tissot watches but they have always seemed a bit too over-the-top for every-day wear), a curb-link bracelet, a cross with my name engraved, and a curb link chain necklace. The necklaces are worn under the shirt, and the bracelet isn’t super thick or anything, so no I don’t look ridiculous. I also substituted a traditional class ring for a custom-made signet ring with a three-letter monogram. All of these pieces are made from 316L steel, which was a big shift from my original intention to get these pieces all in 14kt white gold. What I found was that, just as anything else, quality comes with a price tag. I ended up spending nearly what I would’ve spent had I got them all in gold. The nice thing is, I will likely never have to replace any of these things. Gold and platinum have been used in jewelry for several thousand years, and 316L steel has existed for around a hundred years. Since SS has such superior characteristics when compared to these traditional metals, would it be accurate to assume that had it been around for the same amount of time it would be seen in a better light than it is today? It seems that a combination of its relatively recent creation and the fact that the market is flooded with cheaply-manufactured and trashy jewelry made from it, it is looked down upon. It seems that SS would be praised and cherished by the jewelry industry if its reputation was strictly determined by a logical, merit-based system. I’m the lucky one; I found this article at the start of my research! I want to have a wedding band custom made that will 1) combine various stones from heirloom rings; 2) be channel-set to avoid scratching the people I transfer from wheelchairs to other devices multiple times daily; 3) be durable enough to withstand rough treatment both at school and on our farm. I started considering SS when I found a really lovely SS ring on a trip to Vancouver. I just found the source that addressed all of my questions—thanks! Wonderful reading. Thank you for sharing your knowledge. Ive been thinking of adding a precious metal watch (white gold) to my collection but after reading this article l will now be exploring the option of platinum. As a token Poor Person contributing to this fascinating thread, I will never be able to afford a precious metal watch. They’re as out of reach to me as a big car or a big house. But I don’t care! I have a Casio Edifice EFB504J, which isn’t likely to be featured in Quill & Pad, as it probably costs less than a link pin in a PP strap. It’s mass-produced, cheap (did I mention that?) and it’s perfect. Stainless steel cut and polished to a gleaming high gloss. Sapphire crystal. Manufactured and assembled in Japan. More accurate than I’ll ever need it to be. I’ll very probably never need or want another watch. So although I enjoy reading Q&P, nothing can convince me that there’s a better or more beautiful object for telling the time than my mall-bought Edifice. Thanks anyway! Thank you for sharing, Elson! The perfecting of stainless steel as a watch casing has brought the manufacturing standards of inexpensive (digital) watches very close to those of high-end brands. In terms of daily use, as functional tools, and even as adornment, the difference is imperceptible to anyone who is not an expert. The inherent value (in terms of prestige and materials) of mechanical watches is easier to understand; the workmanship involved in creating a movement will always command a premium, even though the aim of those skills is to (functionally, at least) measure time with the accuracy of an electronic chip! Phillips Stages Thematic Auction Of Stainless Steel Chronographs: A Reaction To Market Conditions?